US President Donald Trump has decided to end exemptions from sanctions for countries still buying oil from Iran. The White House said waivers for China, India, Japan, South Korea and Turkey would expire in May, after which they could face US sanctions themselves. This decision is intended to bring Iran’s oil exports to zero, denying the government its main source of revenue. Iran insisted the sanctions were illegal and that it had attached “no value or credibility” to the waivers. Mr Trump reinstated the sanctions last year after abandoning a landmark 2015 nuclear deal between Iran and six world powers. Under the accord, Iran agreed to limit its sensitive nuclear activities and allow in international inspectors in return for sanctions relief. The Trump administration hopes to compel Iran to negotiate a “new deal” that would cover not only its nuclear activities, but also its ballistic missile programme and what officials call its “malign behaviour” across the Middle East. The sanctions have led to a sharp downturn in Iran’s economy, pushing the value of its currency to record lows, quadrupling its annual inflation rate, driving away foreign investors, and triggering protests. Why aren’t the waivers being renewed? In November, the US reimposed sanctions on Iran’s energy, ship building, shipping, and banking sectors, which officials called “the core areas” of its economy. However, six-month waivers from economic penalties were granted to the eight main buyers of Iranian crude – China, India, Japan, South Korea, Taiwan, Turkey, Italy and Greece – to give them time to find alternative sources and avoid causing a shock to global oil markets. Three of the eight buyers – Greece, Italy and Taiwan – have stopped importing Iranian oil. But the others had reportedly asked for their waivers to be extended. US Secretary of State Mike Pompeo said Mr Trump’s decision not to renew the waivers showed his administration was “dramatically accelerating our pressure campaign in a calibrated way that meets our national security objectives while maintaining well supplied global oil markets”. “We stand by our allies and partners as they transition away from Iranian crude to other alternatives,” he added. In recent weeks, Japan and South Korea have either halted or sharply decreased Iranian oil imports. Both are heavily dependent on foreign oil and Mr Pompeo said the administration had been trying to find alternatives. But Monday’s move could strain relations – already tested over issues of trade and US policy towards North Korea – with these close allies. It’s an even bigger problem for India, which is also under American pressure to cut oil purchases from Venezuela. Iran is one of Delhi’s main oil suppliers. But India also has deep cultural and political ties with Tehran, which make it difficult to join US efforts to isolate the Islamic Republic. China is Iran’s other big customer: it has slammed the US decision, saying its trade is perfectly legal, and the US has no jurisdiction to interfere. The question is whether Beijing will try to skirt sanctions through companies not tied to the US financial system. Turkey was most outspoken in lobbying for a waiver extension. Ankara argues that it badly needs the oil, that as a neighbour it can’t cut ties with Iran, and that the pressure campaign won’t work anyway. Saudi Energy Minister Khalid al-Falih said his country would co-ordinate with fellow oil producers to ensure “the global oil market does not go out of balance”. Iranian exports are currently estimated to be below 1 million barrels per day (bpd), compared to more than 2.5 million bpd before Mr Trump abandoned the nuclear deal last May. What has been the impact on oil prices? The price of global benchmark Brent crude rose by 3.33% to $74.37 a barrel in trading on Monday – the highest since 1 November. US oil – known as West Texas Intermediate – was meanwhile up 2.90% at $65.93. In recent months, the price of oil has risen due to an agreement between the Organization of the Petroleum Exporting Countries (Opec) cartel and its allies, including Russia, to cut their output by 1.2 million bpd. How have the countries affected reacted? A spokesman for Iran’s foreign ministry dismissed Mr Trump’s decision, saying the country “did not and does not attach any value or credibility to the waivers”. But Abbas Mousavi added that because of the sanctions’ negative effects, Iran was in “constant contact” with its international partners and would act accordingly. Turkish Foreign Minister Mevlut Cavusoglu tweeted that the US move would “not serve regional peace and stability, yet will harm Iranian people”. “Turkey rejects unilateral sanctions and impositions on how to conduct relations with neighbours,” he added. China said earlier that it opposed unilateral US sanctions. “China-Iran co-operation is open, transparent and in accordance with law. It should be respected,” foreign ministry spokesman Geng Shuang told reporters. Japan’s chief cabinet secretary, Yoshihide Suga, was quoted by the Financial Times as saying there should be no “negative effect on the operations of Japanese companies”. Its refineries reportedly halted Iranian imports in March. India’s government was studying the implications of the US announcement, the PTI news agency cited sources as saying. 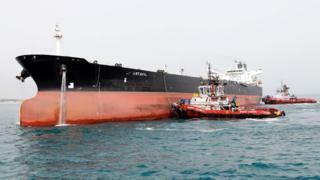 The country had reportedly hoped to be allowed to continue to reduce its Iranian oil imports gradually. South Korea stopped buying Iranian oil for four months in response, but resumed in January. In March, it imported 284,600 bpd.